In this series of blog posts I am going to study the empty visual studio template for ASP.NET Core. Create a new ASP.NET Web Application. 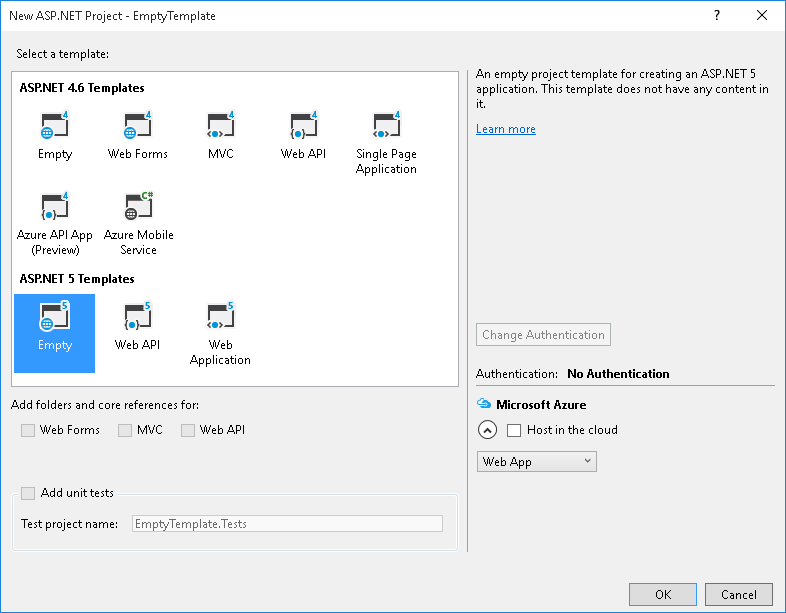 Choose empty template for ASP.NET Core (ASP.NET 5 in the figure below). After creating a new web application using empty Visual Studio template for ASP.NET Core we get the following structure on the file system. 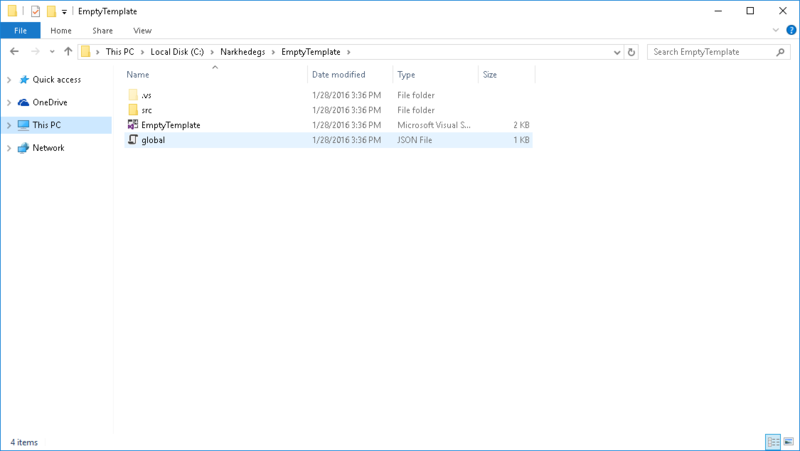 EmptyTemplate - Folder for our application that is created using the empty visual studio template for ASP.NET Core. .vs - Hidden folder used by Visual Studio for keeping some configuration. For example configuration related to IISExpress etc. .sln file - Plane old Visual Studio solution file. global.json file - A json file to configure the whole solution. 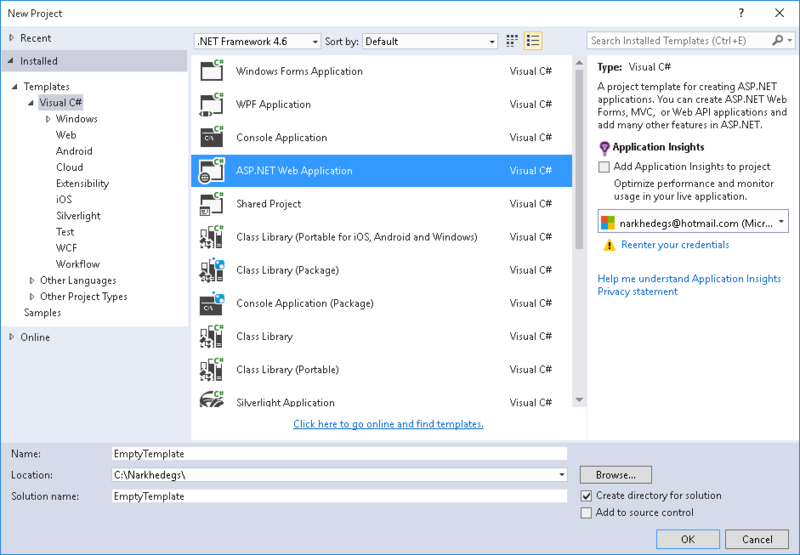 The "solution" here simply refers to a collection of ASP.NET Core 1.0 projects and not the Visual Studio Solution as the ASP.NET Core 1.0 applications can be developed without Visual Studio. src - Folder for the source code for this application based on the settings in global.json file. I said "based on the settings in global.json file" in the previous sentense because the name and path of this folder is configured inside the "projects" section in global.json file. In this post we looked at the file structure generated on the file system by the empty visual studio template for ASP.NET Core. Learning .NET Core Part 1 – What is .NET Core ? © 2016 - Gaurav Narkhede.